This little guy really gets around. 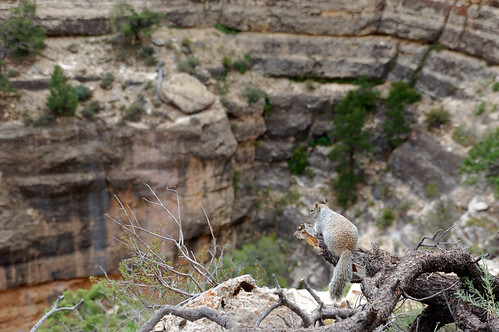 Rice, a traveling squirrel, has now made it to all 50 states, and you can see his full adventures on Flickr. He’s part of one young man’s vision to complete the Hometown Invasion Tour, where he travels across the country. I have to admit: I find this sort of random squirrel traveling pretty awesome, even if Rice isn’t a real live squirrel, and I especially like how Rice’s owner has posed Rice in ways that look very squirrel authentic, like this one. Rice is not the only traveling squirrel friend to be found on Flickr, there’s also this guy who takes his no-name raggedy stuffed squirrel on some of his adventures. And there’s this couple, who seem to like to take a tiny wooden squirrel on travel adventures, too. rice eats a golf ball, originally uploaded by Hometown Invasion Tour.